A large residential renovation project for an early 20th century house experienced difficulties with significant delays and cost over runs during construction. The contractor defaulted on the project near the end of the job. Chandler was recommended by the attorney and engaged to evaluate project status. A 250 item punch list was developed with the Owner. Plans and specifications were reviewed and compared to deficiencies. Much work was not documented in out of date design documents or in the contract records. The architect was unavailable for assistance. A detailed workout program was set with detailed budget and schedule. All subcontractors and vendors were re-engaged and payment status was verified against work in place. The program was set in motion with daily on site management to finish uncompleted work, correct deficiencies and resolve outstanding design issues. The workout experience and skills of Chandler were invaluable to the Owner in bringing to project to completion and obtaining all approvals and permits. Reports and documentation by Chandler allowed successful contract terminations for the Owner. Chandler approached the completion as in any project with scheduling and budget controls to inform the Owner and provide benchmarks for performance. Chandler executed procurement of all outstanding items. Weekly meetings and numerous on site meetings with subcontractors and vendors re-energized all parties for a successful completion. The Owner has expressed gratitude for the work of Chandler and regrets that the company had not been engaged at the outset of the project. This project involved the extensive redesign and reconstruction of a large house and site on Ocean Drive over an extended period. The project included a new guest house, pool and cabana. A complicated project was especially challenging with the Owners, design architect, landscape architect and decorator based in locales from Europe to New York to Virginia. The project underwent a period of re-evaluation, then restarted with firm management controls. Cost, schedule and quality objectives were successfully met. The reconstruction proceeded in phases allowing for design input at scheduled intervals. Good use was made of computer communications with sketches, photos and other data for interim field adjustments. A cost effective management program was designed and executed from Connecticut with periodic visits, weekly or bi-weekly, as required. A complete and successful transformation was accomplished within the cost range of high value projects in the area. For 14 years for this client Chandler provided on-going services for multiple projects starting with initial design and development of this estate on 46 acre site. While “Green” was not a stated objective, good traditional design and commonsense incorporated many features that are now requirements of Green rating programs. A new house of Georgian design with companion orangerie joined by classical English garden was set in understated landscaping preserving the country setting. The carefully planned driveway crosses a stream over a wooden timber bridge and winds through woods up a steep hill to break into an open field through an opening in restored stone walls. A dramatic view of the house set on the hill above is the reward of this carefully designed and constructed approach. A diverse team of professionals was managed and coordinated to achieve a successful project. Professional owner representation provided the owner with options to make clear cut decisions distilled from complex information. Foresight and planning accomplished documented cost savings well in excess of 10 times the fee for services. A contracting strategy was established to allow Owner through the project manager to separately contract and manage construction of bridge and road saving fees from general contractor selected for house and out buildings. 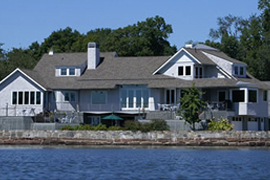 A waterfront property on Long Island Sound was acquired by the client. The purchase included approved architectural plans. The owner was unable to contract with the original architect for the construction phase and hired Chandler to develop and manage a program to construct the project. An architect was selected to provide interpretation of the plans and for site inspection at weekly project meetings. A contract was negotiated with a contractor selected by the Owner. Additional consultants hired by the owner: surveyor, soils engineer, marine engineer, piling contractor, structural engineer, MEP engineer and AV/IT designer/vendor. The site was in the flood plain and under US Army Corp of Engineers jurisdiction. Strict adherence to FEMA guidelines was mandatory. Other state and local approvals had to be secured. All grade level structures had to meet hurricane standards for foundations and support structure with breakaway enclosure walls. Extensive piling was required with pile caps tied together with structural grade beams. The waterside of the site was bordered by an old stone bulkhead wall. The site development was carefully orchestrated for elaborate testing. The stone bulkhead was tested and examined for structural integrity. Points of concern were marked and plotted. This work was coordinated with the soils testing and with vibration monitoring during pile driving. All foundation work was precisely surveyed and plotted before and after installation including elevations. Rebar placement and documentation was inspected. All structural steel and connections were documented, inspected, and surveyed three dimensionally and certified. Any error in construction layout or missed step in the approval process could have halted the project. The house was contemporary in design on a narrow site. The interior was multi-level and open with two and three story angular spaces and exposed structure. Design details had not been developed for many situations, both interior and exterior. Roof intersections were a particular concern for weather integrity. Much equipment and fixtures had not been specified or located. Considerable design interpretation was required throughout the job particularly for the finishes. Chandler organized, coordinated and managed the entire program of technical expertise and work that had to be meticulously executed for a successful outcome. Management included the coordination and securing of all required inspections, sign offs and permitting. The Owner was informed throughout the process with CPM scheduling, budgets, minutes from weekly meetings and sub meetings, on-site oversight and with action lists.